EA Wizard is software that allows anybody to create Expert Advisors for MetaTrader4, quickly, simply, without programming. Easily design EAs using multiple currencies and multiple timeframes, custom indicators, emails warnings, trading time filters, and money management options. 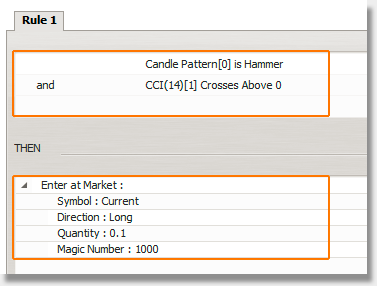 Watch me creating an EMA cross strategy in EA Wizard just in 2 minutes, without any programming. 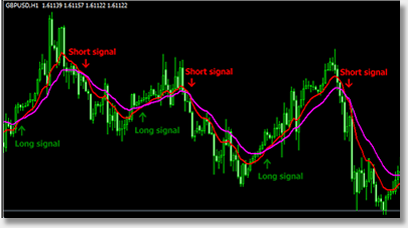 Signal alert – Metatrader will notice you about trading opportunity, and you will choose if to open trade or not. Doesn’t matter how complex the strategy is, it can be always broken down to simple trading rules. Are you able to create rules like these ? That’s all you need to make an EA! EA Wizard is suitable for new traders. You can test all your trading ideas during a moment. Therefore you can avoid tiring manual backtesting. To have EA Wizard is like to employ a team of traders that work only for you. You give them your idea, and they immediately implement it. And this happened in real time, without arguing and paying for every change made in the Expert Advisor. Let trading robots work for you and invest your time into your hobbies. Created strategy can be exported and ran in MetaTrader. From now on, it trades automatically. My name is Mark Fric and I’m professional trader, focusing mainly on automated trading. As a professional trader I often test new trading ideas by coding them into an EA and backtesting it on historical market data. I have a programming background, but it always takes some time to convert the idea of the strategy into an EA. 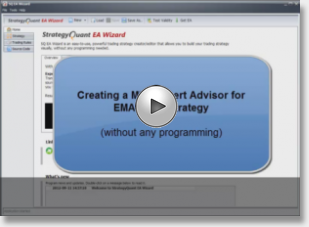 To speed things up, I created StrategyQuant EA Wizard – a tool that enables me to make a new EA quickly, with minimum effort, without any programming. I believe it is the simplest and at the same time the most powerful editor of the trading strategies available. I shared this tool with a small group of my friends and they were all excited with its functionality. We use it virtually every day, I cannot imagine living without a possibility to convert my idea into an EA and immediately testing its profitability. Now you too can use this powerful tool. Generating an idea into an Indicator is also genius. It is much easier to see how an idea would work out. Three days to three hours. That’s how long it took before and how long it takes now, to make a simple, experimental EA. Can’t thanks you. And at the cost, I almost am willing to pay twice for powerful program. And the support has been great. And there’s more, the new version has added so much more flexibility. Whatever is next, I will take it. I have to say, this software is just awesome! I have needed this for at least 5-7 years. I have paid a ton of money to have ideas created, only to find out they were not a good idea. This is exactly what I have been looking for.